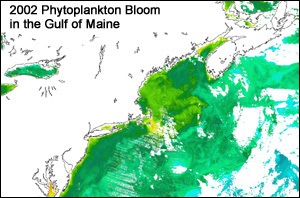 Part 1-What Causes a Phytoplankton Bloom in the Gulf of Maine? Colorful phytoplankton blooms are complex phenomena that have attracted fishermen and perplexed scientists for decades. A phytoplankton bloom has been defined as a "high concentration of phytoplankton in an area, caused by increased reproduction; [this] often produces discoloration of the water" (Garrison, 2005). 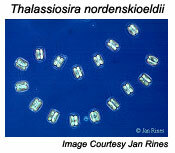 More generally, a bloom can be considered as a phytoplankton population explosion-blooms occur when sunlight and nutrients are readily available to the plants, and they grow and reproduce to a point where they are so dense that their presence changes the color of the water in which they live. Blooms can be quick events that begin and end within a few days or they may last several weeks. They can occur on a relatively small scale or cover hundreds of square kilometers of the ocean's surface. In the Gulf of Maine, spring and fall blooms occur on an annual basis. Smaller blooms have also been detected during other times of the year. Scientists have not yet been able to predict the exact date and location of a phytoplankton bloom before it occurs, but through the use of satellites, long term moored buoys and monthly oceanographic research cruises we are able to make better educated guesses. The data analysis you will do in this chapter is considered cutting edge research for the advancement of science! Scientists consider many factors that influence where and when phytoplankton blooms occur. Some of the most important factors include water temperature, density, and salinity, hydrography of the region, availability of nutrients, what species and the amount of phytoplankton biomass that is present, what types of zooplankton are grazing on the phytoplankton, and available sunlight levels. There are very few "permanent" parameters (i.e. bathymetry/hydrography) in this system; the constantly changing values of most parameters make blooms somewhat difficult to study. This primer is intended to focus only on the oceanographic principles that influence phytoplankton blooms that can be monitored by instruments on buoys and satellites. Scientists have been studying microscopic organisms in the oceans for decades using simple collection nets and collecting jars. Today, scientists study phytoplankton using research vessels, long term moored buoys, and satellite instruments. Based on oceanographic studies that utilize all of these methods, we now know that phytoplankton blooms occur around the world in regions of upwelling or along convergent currents known as fronts. In the Gulf of Maine, the dynamics are very unique. 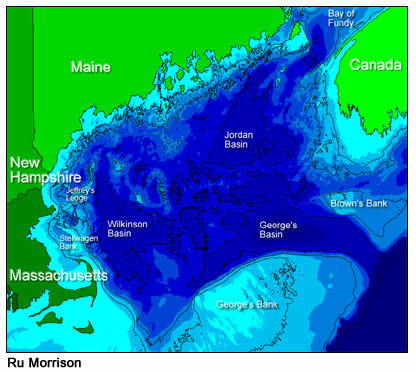 In studying the Gulf of Maine ecosystem, it is essential to understand how the bathymetry (depth and shape of the ocean floor) affects water movement in the region. The Gulf of Maine is almost entirely enclosed by land. Three Canadian Provinces and three US states surround the Gulf of Maine creating a semi-circle shaped body of water that is still connected to the Atlantic Ocean. A signature feature unique to the Gulf of Maine is the underwater ledges and banks that separate the water within the Gulf from the Atlantic Ocean. Before bathymetric maps, many people thought there was no separation between Atlantic waters and the Gulf but we now know that Georges Bank and Browns Bank are just two of the large underwater ledges that create a barrier between waters off shore and the inner Gulf of Maine. The Northeast Channel and the Great South Channel are the two main valleys that allow most of the water to enter and exit from the region. As seen in this picture, the red arrows indicate denser water flowing in through the Northeast Channel. This band of water can be both warm and cold depending on the current flow and can bring in new sources of nutrients trapped in this submerged layer of water. Water still flows continuously over the ledges creating nutrient mixing and fast moving currents which is why you will see a high chlorophyll reading in the satellite images in that area. Inside the Gulf, there are 3 prevalent basins known as Wilkinson Basin, Georges Basin, and Jordan Basin. These also play a large part in the physical dynamics of the Gulf of Maine. Because of the speed of the incoming currents as well as other forces, water in the Gulf of Maine circulates counterclockwise. Cold water from the north, known as the Labrador Current, and warm water from the south, known as the Gulf Stream, are mixed outside the Gulf before entering. The combination of these consistent currents, the direction of flow, the bathymetry and much more, makes the physical structure of the water column very different at each buoy location. This is why it is important to include different buoys in your study. The tilt of Earth's axis and its revolution about the sun cause seasons to change. We know the difference between summer and winter weather on land, but we are less familiar with how the weather changes underwater. The ocean experiences changes in seasons too! We can track how ocean "weather" changes by studying changes in the temperature, salinity, and density of columns of water from the ocean bottom to the surface. The concept of such a vertical sample of water is referred to as the water column. In the atmosphere, air temperature, humidity, and pressure change with altitude. Similarly, various parameters underwater change with depth: these include water temperature, salinity, density, and pressure. The density (mass per unit volume) of seawater is controlled by its temperature and salinity (Spokes, 2003). The higher the salt content (salinity) of water, the higher the density. Conversely, the higher the water temperature, the lower the density. Differences in density are responsible for things sinking or floating: less dense things float on top of more dense things. Therefore, relatively fresh, warm water will float on top of salty, cool water. When ocean water becomes separated into layers of similar densities, it is said to be stratified or that stratification has occurred. Density stratification is the formation of layers, with each deeper layer being denser (weighing more per unit of volume) than the layer above it (Garrison, 2005). 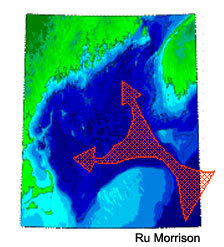 The Gulf of Maine, like the ocean, is divided into three density zones, the surface zone, the pycnocline-a layer in which the density increases significantly with an increase in depth, and the deep zone (Garrison, 2005). The depth of each zone varies with location. In vertical profiles of water from the Gulf of Maine (above), cool, dense water is on the bottom and warmer, less dense water floats on top. This situation is most obvious in the spring and summer profiles. 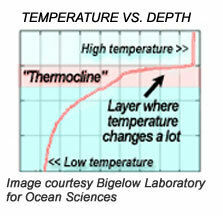 Both the color and the black lines in each graphic indicate water temperature at various depths. In winter, you can see that the water is generally uniform in temperature throughout the water column due to heavy mixing. In summer, water near the surface is warmer and therefore less dense than deeper water. Just as storms mix the atmosphere, heavy winds, strong currents, and tidal forces mix water in the ocean. The mixing churns up relatively stable stratified water, bringing dense water up and forcing less dense water down. This brings nutrients that were confined to the deep zone to the surface zone. In the winter months, the water column is fully mixed due to the prevalence of winter storms. Even if storms are absent, the cold atmospheric temperatures of winter chill the surface layers of the ocean. The result is that surface waters becomes too dense to be supported and they sink to the bottom, displacing the less dense, nutrient-rich water below, keeping the water mixed. Once spring comes, the higher atmospheric temperatures warm the surface waters, decreasing their density, and stratified layers develop again. This annual cycle of mixing and stratification repeats each year. The status of the water column is monitored by instruments on buoys: by analyzing these data, we can interpret if the water is mixed or stratified when blooms occur. Nutrients play an essential role in supporting a phytoplankton bloom. Phytoplankton rely on sunlight and available nutrients for energy and growth. Carbon dioxide, water, and light are necessary for photosynthesis. Nitrate, phosphate, silicate, and carbonate are all important in the production of plant matter. Silicon, phosphorus, and nitrogen also play a key role in growing plants. Because their concentrations fluctuate, nitrogen and phosphate influence the rates of phytoplankton production in the ocean. Concentrations of nutrients in the water column vary depending on the time of year, density of water, how they entered the ocean, and how much mixing has taken place during that season. In addition, each of these constituents have different residence times, or time remaining in the water column. This factor has a direct influence on the intensity of the phytoplankton bloom. In summary, nutrient availability is influenced by a range of complex factors in the Gulf of Maine. How do we know what nutrients are available at different depths in the ocean? Currently, nutrient data is collected from water samples gathered on research vessels. Long term oceanographic buoys are not regularly equipped with the technology to measure nutrient levels, although research is currently being done to outfit buoys with real time nutrient sensors. What the water samples do tell us is that nutrient availability in the water column changes with the seasons. Winter mixing brings nutrients up from below, concentrating them near the surface. Spring warming creates a surface layer that floats on top, halting the supply of nutrients brought to the surface. As spring turns to summer, nutrients in the surface layer are consumed by phytoplankton, reducing nutrient availability at the surface. As summer sets in, phytoplankton die and drift to the bottom, taking the nutrients they ingested with them. Surface waters are now left with few nutrients available. Through the summer, this situation is reinforced as the surface waters are warmed and the stable situation of stratification sets in. Once autumn sets in with cooler days, a limited amount of vertical mixing brings nutrients up from below. In winter, heavy winds and plummeting temperatures cause strong mixing again. In general, when nutrients are found near the surface, they are not plentiful at deeper levels and vice versa. A more in-depth exploration of nutrient dynamics and how they influence phytoplankton blooms on a seasonal basis can be explored by studying ocean chemistry. Spring brings warmer temperatures and increased sunlight, creating a thermocline that traps nutrients at the ocean surface. This allows phytoplankton to absorb energy and take in the nutrients they need to photosynthesize and multiply. The warming of the surface layer keeps this water less dense, so it stays afloat. Phytoplankton respond very quickly when the right conditions occur, growing and reproducing as soon as a slight stratification of the water column occurs. As phytoplankton continue thriving in the nutrient-rich surface zone where they receive sunlight, they may become so plentiful that the ocean waters turn green, brown, or red from the chlorophyll they contain. As the phytoplankton use up the available nutrients however, they begin to die and drift to the bottom. As autumn begins, cooler days cause some vertical mixing that may bring nutrients up from below resulting in a relatively smaller fall bloom. Once winter begins, plummeting temperatures and frequent storms cause heavy mixing. As phytoplankton do not remain at the surface in this mix, they do not have ready access to sunlight, so blooms do not occur in the winter. The community structure of a phytoplankton bloom depends on the geographic location of the bloom as well as its timing and duration. In the Gulf of Maine, some of the common species found during the spring phytoplankton bloom are diatoms. These images show two species of diatoms, both are single celled organisms that are linked to form chains. Diatoms are often seen during the initial stages of a bloom. Generally, they consume nutrients and multiply before another plankton group, the dinoflagellates emerges. Diatoms grow faster than dinoflagellates. They generally bloom first if there is enough silicic acid in the water column. Diatoms use silica to produce their glass-like cell wall structure. Phytoplankton blooms are created by an array of complex factors and influences that can combine to form conditions that cause a bloom, or a high concentration of phytoplankton in an area. Stratification of the water column with an influx of nutrients and sunlight can create an exciting display of blooming life. With an introductory level of information and instructions on how to find and graph data, you are now better equipped to make educated guesses about when the spring bloom might happen. A few years ago, we did not have access to the amount of data that is now available because the necessary tools were not in place. With long term data sets collected from moored buoys such as the GoMOOS buoy system and an extensive library of satellite images, teachers and their students are now able to ask similar questions that can lead to conclusions that are useful to scientists. Understanding the ocean is difficult and complex yet with these new tools it is now more approachable than ever. Enjoy investigating the mystery of the spring bloom! Garrison, Tom. Oceanography: An Invitation to Marine Science. Belmont CA, 2005. Spokes, L. Phytoplankton and nutrients in the oceans. ESPERE. (16-October 2003). Miller, Charles. Biological Oceanography. Oxford UK, 2004.